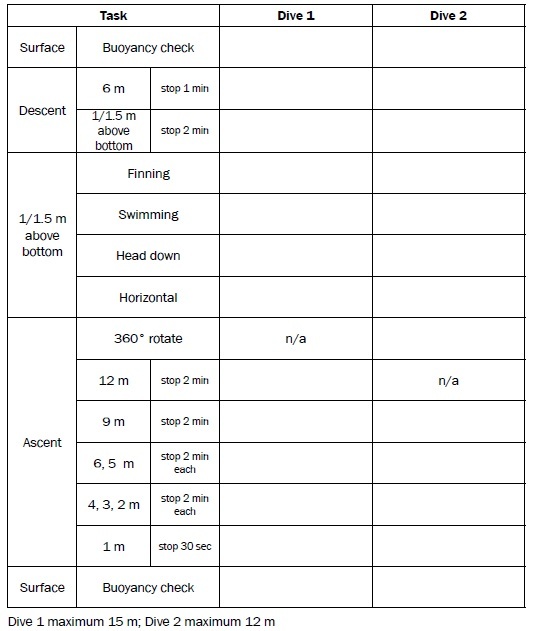 There can be no doubt that one of the single most important skills to master in diving is buoyancy control and trim. Perfecting this aspect of your diving is a major step towards safe, comfortable diving and it can also have a positive impact on the amount of breathing gas you consume, the amount of energy you use and the general all round confidence you feel when diving. Good buoyancy control is also key in terms of protecting marine life such as coral reefs and keeping the environment silt free for others diving the same site after you. I myself have experienced several up’s and downs (quite literally!) since I returned to diving just under a year ago. 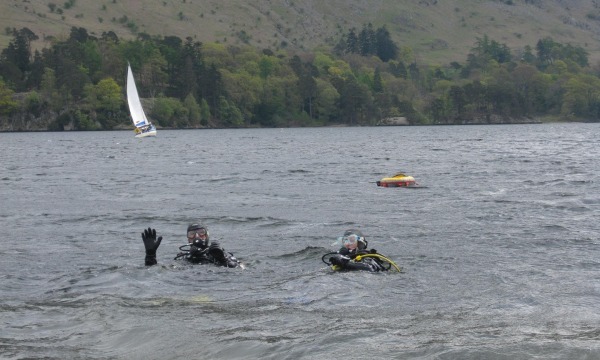 It was January 2012 at Capernwray whilst attempting a 6m safety stop that I found myself uncontrollably heading for the surface unable to do anything about it except feel frustrated and embarrassed. I remember peering down at my buddy and watching as he looked over each shoulder to try and find me before eventually looking up to see my helplessly bobbing around at the surface. It was a sobering experience – we had only dived to around 16m and had not gone into deco – but the thought that this might happen following a deeper dive worried me. When the opportunity arose to do the Buoyancy and Control Workshop I signed up immediately, along with two other 114 members, Liz and Jonathan.  The workshop is one of BSACs many Skills Development Courses which, with qualified instructors on hand, can be run in house. 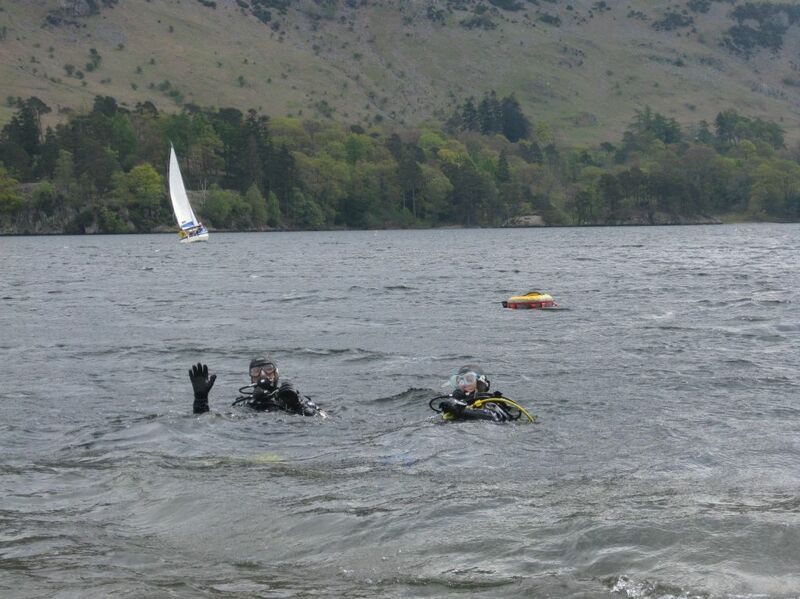 It consists of two parts; a theory lesson followed by an open water practical session. 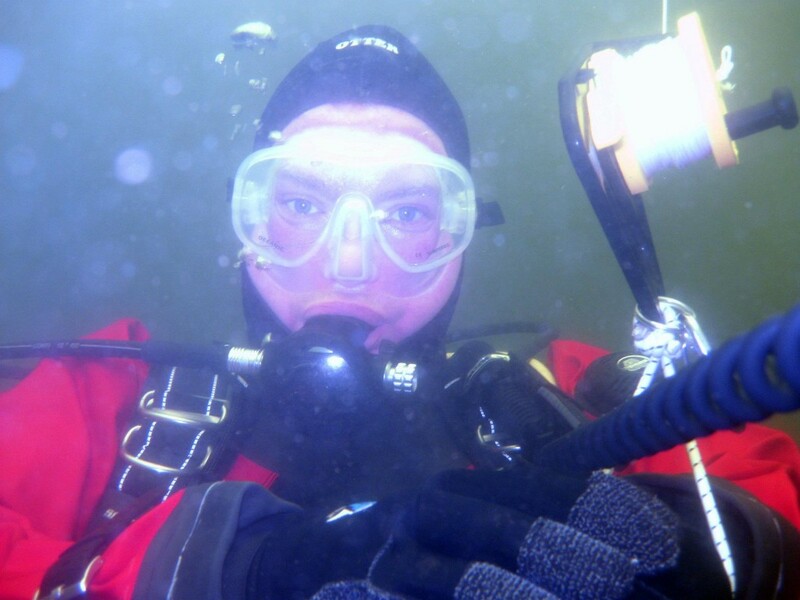 The key aim of the workshop is to understand the issues that affect buoyancy and trim, identifying the correct amount of weight to carry, and to dive maintaining the most optimum position at different depths. 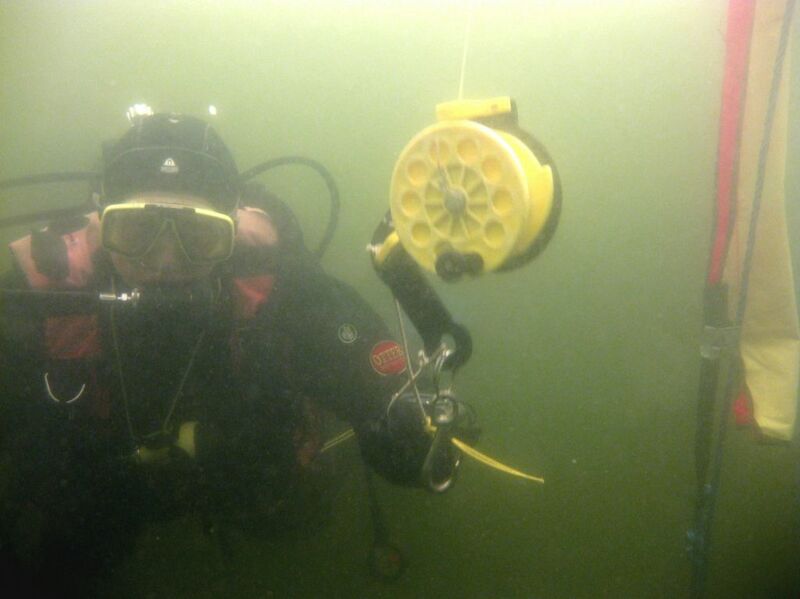 Andy Hunt, a BSAC National Instructor, led the training. First off was the lecture. 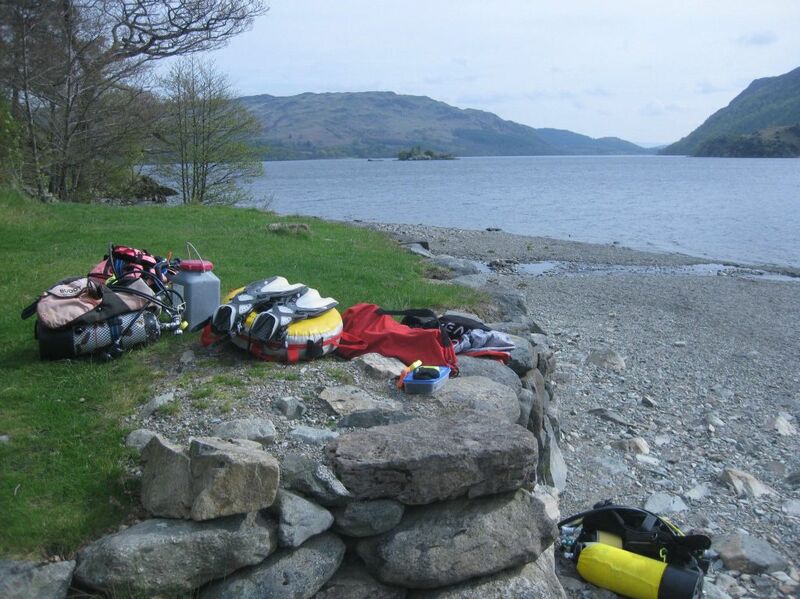 This covered matters such as understanding issues that lead towards buoyancy problems, recognising the symptoms of poor buoyancy and how to overcome them, recognising the signs of overweighting, appreciating correct weighting for fresh and salt water diving and for different kit configurations and understanding the importance of trim. All three of us sat through the lecture absorbing as much of the information as possible – much of this course is about reinforcing what you will already have been taught in Ocean Diver and Sports Diver lectures, but it proved a useful refresher. The practical session is where the fun really begins! 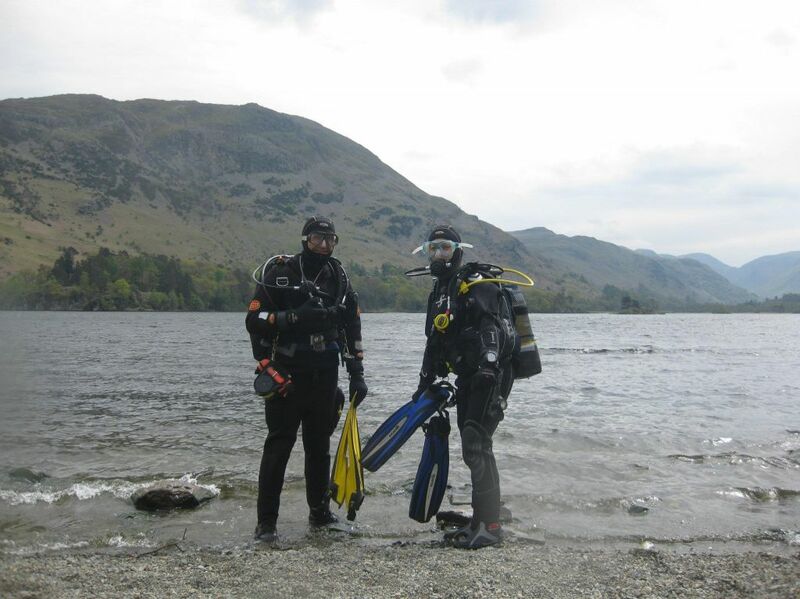 For us this was in the guise of 2 open water dives at Ullswater. The forecast was for rain in the afternoon so we made an early start to beat the weather. Arriving at Stybarrow Crag at 8.30am we set up our base camp and got the kit prepared. Jonathan couldn’t make it so Liz would be diving with Hubert and I would be diving with Andy. We would be challenged to descend to 15m without disturbing the bottom and then to make and hold stops at various points on a bottom tensioned shot line whilst being task loaded. The shot consisted of a float, rope and lead weight with markers placed at set points on the line at 12m, 9m, 6m, 5m, 4m, 3m, 2m and eventually 1m . Once in the water we headed for the shot, which Andy had already prepared and then made our slow ascent down the line without touching it. Andy indicated for us to stop at 6m. Managing to dump air very gradually from my dry suit, I slowed to a stop as we approached 6m and held my position. We waited for 2 minutes and then began to descend deeper. As we approached 15m, Andy reminded me not to stir up the silt. 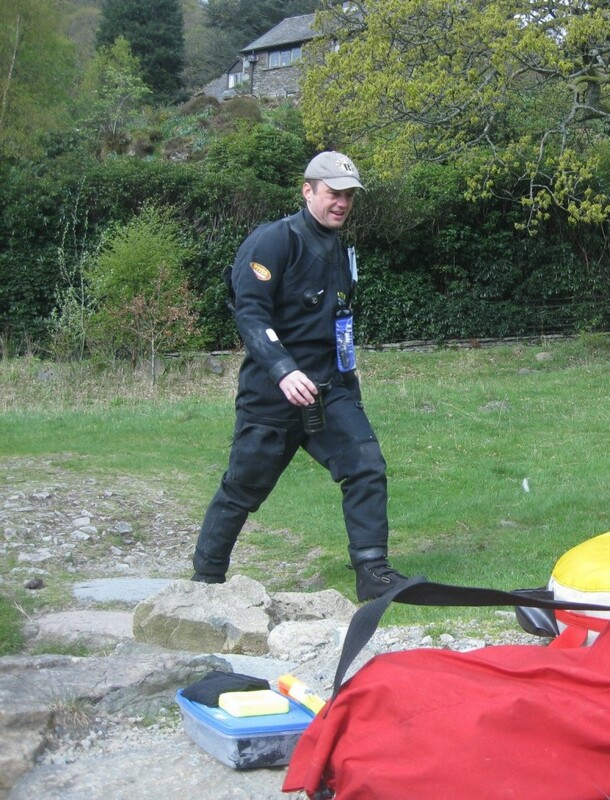 I fired a few short bursts of air into my dry suit to control my descent and slowed to a stop just inches off the bottom. As we hovered Andy pulled out a slate and begun drawing a grid. As I concentrated on keeping myself level I quickly realised we were about to have a game of noughts and crosses! Nothing like a bit of task loading to test your ability! He drew an ‘X’ on the grid and passed it to me. I quickly drew a ‘O’ and passed it back – not focussing on winning the game; simply trying to hold my position and get rid of the slate as quickly as possible! We completed the game with no silt in sight. The next task was to fin whilst keeping our body position horizontal and whilst staying near to the bottom without stirring it up. We swam in a quare about 10m in each direction and found our way back to the line in the limited visibility of Ullswater. Still no silt! So far so good. Then was the tricky part – ascending the line and holding position at increasingly shallower depths. Because the expansion of air is more pronounced the shallower one gets the ability to effectively dump air from your dry suit or BC is paramount. Additional black tags had been placed above and below each depth marker on the line – this was to give Andy and us trainees an indication of how accurately we were staying to our depth and provide a means of grading buoyancy. We ascended to 12m and Andy gave the signal to hold position for 2 minutes. We stopped at the marker and I held my position. I was quickly reminded not to use my fins and to maintain a horizontal trim. About 30 seconds in Andy executed a 360 degree horizontal rotation and then indicated for me to copy. I turned my body around and by the time the line came back into view I realised I had drifted upwards. Getting a feel for the sensation I tried again – this time much better. Up to the next marker. At 9m we stopped for another two minutes – this time the task was to execute a forward roll. At 6m it was another 360 horizontal rotation. Then 5, 4, 3, 2 and 1 metres it was a case of simply holding position. 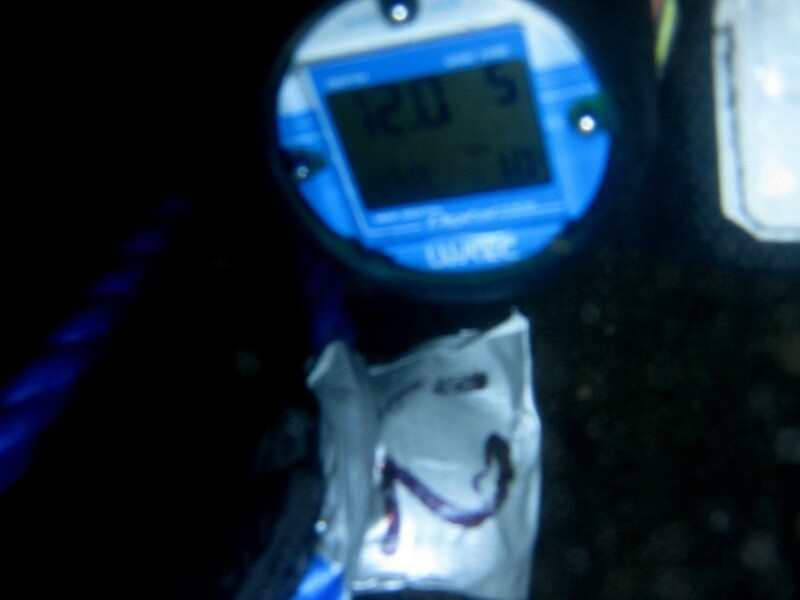 For our second dive we repeated the same drill – but without the drop to 15m. This was a dive to 12m followed by stops up the line as before. At 6m I was directed to deploy my DSMB, another important skill to be able to master midwater. I unfurled the orange tube and opened the end. Ensuring I had detached the marker buoy from my BC I took my octopus and released just enough air into it so that it straightened out. Then when I was ready released a strong blast of air into the tube, exhaling at the same time to compensate for the increased buoyancy. I immediately felt the tension in the line and pressed the trigger, firing the marker to the surface. We ascended further making our stops as before. With everyone out of the water, we started de-kitting and packing equipment back into cars. Just then the rain started to fall. The only solution was to retreat to the pub for hot food and a drink. A quick debrief in the pub and I was delighted to hear I’d passed with a ‘Gold’ rating. Now for more practice and kit fiddling to get the ‘Black’ belt in buoyancy!